Come to Martins Bay Holiday Park and experience incomparable New Zealand camping, off the beaten track, exciting and peaceful – great family fun or quiet tranquillity – Martins Bay has it all. Martins Bay is a holiday park like no other – removed from the hustle and bustle of city life, a welcome escape just one hour north of central Auckland near Warkworth and Snells Beach in the stunning Rodney District. Located on the water’s edge with a sandy beach for safe swimming, beautiful sea views, and brilliant fishing with Kawau Island and the Hauraki Gulf right at your doorstep. In the Christmas holiday summer months, Martins Bay is a vibrant community of friendly people getting together to have fun, make new friends, go fishing and boating, and relax in the sun. For the rest of the year, Martins Bay is unsurpassed for tranquillity, the ultimate place to unwind and let your worries fade away. Surrounded by the beauty of nature: rolling rural pasture behind, established Pohutukawa trees all around, and the sea stretching out to the islands of the Hauraki Gulf in front. 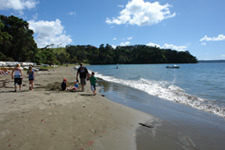 Great for families and people of all ages, Martins Bay Holiday Park is the ideal place to be. It has an excellent range of accommodation options: from adventure camping or powered sites to comfortable self-contained cabins. If you want to get off the beaten track on your tent, caravan, motor home or campervan holiday, Martins Bay offers that opportunity, with superb facilities and within easy driving distance on excellent roads. Enjoy the beachfront atmosphere of Martins Bay, go fishing, boating, sailing, swimming, hire a kayak, or go on day trips exploring Matakana, Mahurangi, Twin Coast Discovery Highway, North Auckland and Northland regions. There is so much to see and do. Leave your troubles behind. Make Martins Bay Holiday Park the most memorable part of your holiday or vacation – we look forward to sharing our beautiful corner of the world with you. •	Check-in time is between 12noon and 8pm (latest). for campsites; and for all accommodation from 2pm until 8pm (latest). •	Check-out time is by 10am on the day of departure. •	Only one vehicle per booking is permitted on site. Others can use the parking in the adjacent Reserve. The amount due is for the number of people stated – additional people will incur extra charges. Please advise when paying your account, if you need to revise the number of people coming to stay. Note: there is a minimum charge of 2 adults per campsite during the peak period. Child rates apply to 3-13 year olds; infants, up to 3 years old, stay for free. We are a family park and excessive noise (loud music etc.) will not be tolerated, at any time. After 10:30 pm all music must be turned off and noise in the park kept at a minimum. Visitors are welcome between 8am and 10pm and are asked to check in at reception. Riding of bikes and skateboards is not permitted in the holiday park for safety reasons. Thank you for booking your holiday with us. We look forward to having you stay with us and helping you have a really enjoyable time at Martins Bay. Refunds will only be given if notice of cancellation is received a minimum of 14 days prior to the commencement of the booked period. (A cancellation fee of $20 is applicable to all bookings if cancelled at any time). Should you no longer require this booking, please inform us in writing, as soon as possible.